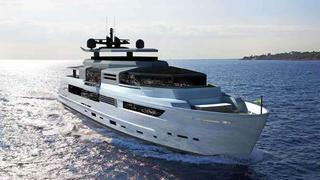 Arcadia Yachts has released more details about the new 44.5m Arcadia 145 superyacht. The steel-hulled and aluminium alloy superstructure double-decked superyacht has a 9.2 metre beam and offers a large interior boasting a generous main deck. The yacht features the solar panel power source found on other models in the Arcadia range on her upper deck, but due to more efficient photovoltaic elements, the panels will produce up to 6kwh, a 25 per cent upgrade in green energy. Both of the two versions of the Arcadia 145 yacht offered by the yard feature the owner's suite on the main deck, with an adjacent office and sitting room, a spacious bathroom and direct access to the lobby. Lighting and spacial concepts are key to the 145’s interior and the designers have included large bay windows, at full height so as to include vertical panels for naturally bright spaces down below. There will be accommodation for 12 guests with eight crew. With fuel capacity coming in at a mighty 45,000 litres, the yacht will have a considerable range. Gross tonnage will remain just below 500GT. Power will come from twin V12 Caterpillar engines at 1,450hp each. The Arcadia 145 is one of several new models Arcadia Yachts introduced this year at the Dusseldorf Boat Show, including the flagship 180 and the 30-metre Arcadia 100, of which hull No 1 is already underway. The yard promises 25 per cent more green energy in all its yachts introduced this year, with double glazing solar panels in all models integrated within the superstructure, ensuring seamless battery recharging and consequently lower generator use. The solar panels will be placed inside special insulating glass that is designed and produced especially for Arcadia.